These worksheets can help your students review decimals number concepts. Worksheets include place value, naming decimals to the nearest tenth and hundredth place, adding decimals, subtracting decimals, multiplying, dividing, and rounding decimals. Label the decimal indicated by each letter on the number line. Write the decimals shown on the number lines. Color the correct number of boxes to make the decimal number. Cut out the decimal cards and lay them on the table in order from least to greatest. Write each mixed number or fraction as a decimal and vice-versa. Convert the written words to decimal numbers. Change the decimal numbers to word names. Fill in the fraction (mixed number), the decimal number, or the decimal word name. Write the value of the underlined digit for each decimal number. Practice writing and reading numbers on this place value chart. Includes thousands, hundreds, tens, ones, and tenths. 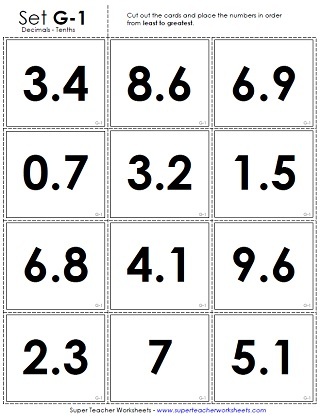 Use this set of task cards to practice rounding decimals to the nearest tenth. Write the decimal and fraction that is shown by each picture. Match the letter on the number line with the decimal. 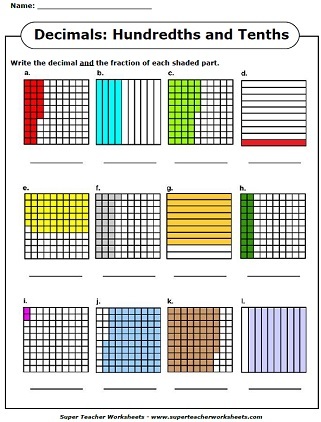 Write the fraction and decimal number that tells what part of the boxes is shaded. Place the number cards in order from smallest to largest. Includes five sets on number cards with whole numbers and hundredths decimals. Place the decimal numbers in order, from least to greatest. Switch the written decimal words into decimal numbers. Convert the decimal numbers into words. Fill in the missing decimal number, the fraction (mixed number) or the word name. Round decimals to the nearest tenth and to the nearest whole number. Determine the value of the underlined digit for each decimal. Write decimal numbers on this chart with place value columns. Place value columns range from hundred thousands to hundredths. Students can write large decimals on this place value chart. Place value columns range from millions to thousandths. Rewrite the decimals shown in order, from least to greatest. Includes decimals up to thousandths. Cut out the cards and order them from least to greatest. Numbers are decimals with a thousandths place. Why did the clock get in trouble at school? To find out, rewrite each mixed number as a decimal. Then use the answers to decode the solution to the riddle. Read each decimal word name and rewrite the decimal in standard form. Just like the above Reading Numbers Wheel, but includes thousandths also. Students cut out the two wheel halves, fasten them together, and spin, reading the displayed number aloud. Includes 6 score sheets for teachers. Look at the picture and write the decimal and fraction. Includes tenths and hundredths. Complete the missing numbers on this hundredths and tenths table. Thirty task cards on identifying decimals names and numbers, write numbers in decimal notation. Includes tenths and hundredths. Students cut out the two wheel halves, fasten them together, and spin, reading the displayed number aloud. Includes 6 score sheets for teachers. Cut the decimal cards apart and arrange the numbers in order from least to greatest. Convert each mixed number into a decimal. Then use the answers to find the answer to the funny riddle. Why did the banana see his doctor? Because he wasn't peeling very well. Cut out the fraction cards. Glue each next to its corresponding decimal. Students must tell which numbers are decimals, which are fractions, and which are mixed numbers. Match the decimal or number on the left with the word name on the right. This worksheet has a section of comparing decimals, a section of ordering decimals, and a word problem. This section of our website has a set of worksheets for teaching students to order and compare decimal numbers. 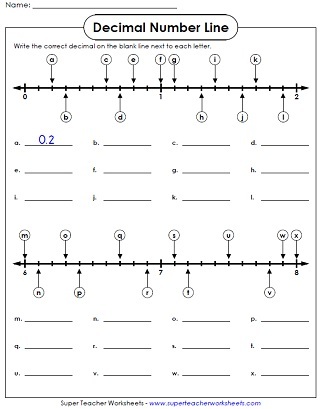 Add and subtract decimal numbers with these printable worksheets. Learn to multiply pairs of numbers with decimal factors. Practice long division math problems with decimals in the dividend and/or divisor. This page has basic fractions, fractions of a set, comparing and ordering fractions, and more. View an index of all math worksheets available on Super Teacher Worksheets.